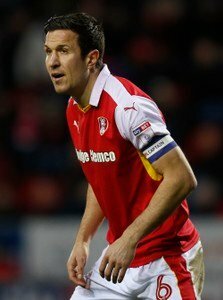 Rotherham United skipper Richard Wood had to leave the pitch with just ten minutes of the second half gone yesterday with what seems to be a groin injury. It is not certain how bad the injury is but I think we are certainly going to miss Woody who holds the team together at the back while also putting himself up front for corners, helping in the Millers second goal against Stoke with a header which fell kindly to Richie Towell to slip over the line. Also on the injury list are strikers Jamie Proctor and Kyle Vassell as well as long-term injured Darren Potter and Sean Raggett. Proctor, who was out the majority of last season, has also got a groin injury sustained in the first half against Nottingham Forest last week and is expected to be sat out for at least five weeks while Vassell also got an injury at the City Ground to his knee and is expected to be missing for around two weeks. Warney also said after the game that he’d been panicking a bit because striker Michael Smith had a scan on Friday on a groin injury and played full of pain killers after not training all week. This is the problem when you only have a small squad. You only need a couple of injuries and you have to start from scratch again with tactics etc. Yes, I know why teams like smaller squads so you’ve nobody sat in the stands and not getting any game time but if Smith is going to succumb to his injury, we are very, very short of strikers as in not having any left to put on. Personally, I’m hoping that Kyle Vassell’s injury is really going to be only ‘a couple of weeks’ as thought because he’s the one I think makes a difference in the team.